By getting up high enough, visitors have to opportunity to realize that Paris is the meeting point for both architectural treasures and assorted views, in a space that is not so large! From above, the capital seems dense and takes on even more beauty. However, visitors need to find the right spots, when Paris can be admired it as it should be, without necessarily emptying the wallet or follow the groups of tourists and their annoying selfie poles. 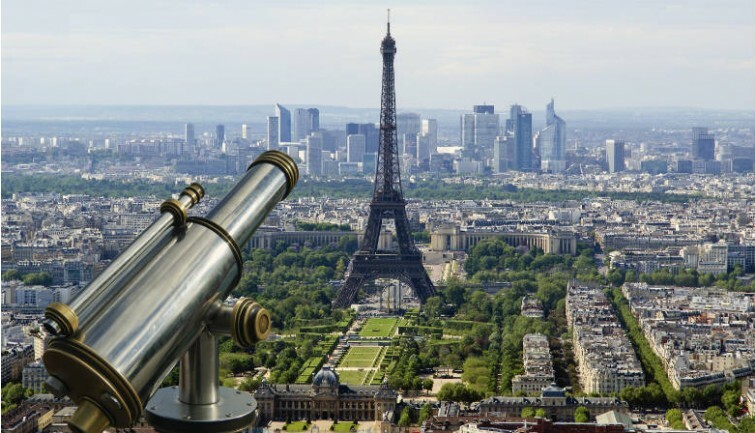 Let us help you discover the perfect locations, that offer a dazzling view of Paris. While some may be well known to the general public, others are more private and offer visitors a more unique and original view. The Eiffel tower is at its most majestic when it is viewed from the balcony of the Trocadero. Tucked among the curvy lines of the colossal Chaillot Palace, emblem of the thirties, terraces and gently sloping gardens, it is bordered with Caucasian walnut trees and ancient hazel trees, sown along with gilded bronzes. Skate-boarders and rollerbladers zigzag along the 20 jets of water in the great basin, overshadowed by Apollo and Hercules, permanently carved into the pavilion. 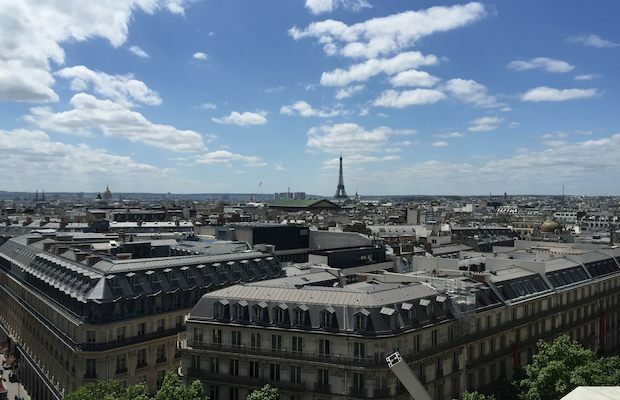 Although you will certainly be joined by numerous other tourist in enjoying the view, it is undeniable that this location, with its mighty tower, peers over Paris, offering an unmissable panorama. Standing at the base of the Basilica of the Sacred Heart, at the top of Montmartre hill, the view is simply extraordinary. The roofs of Paris dominate the skyline and seem to extend into infinity. It is important to note however that the place is very often crowded. If you want to make the most of the view from the famous steps, it’s better to go during off-peak hours. 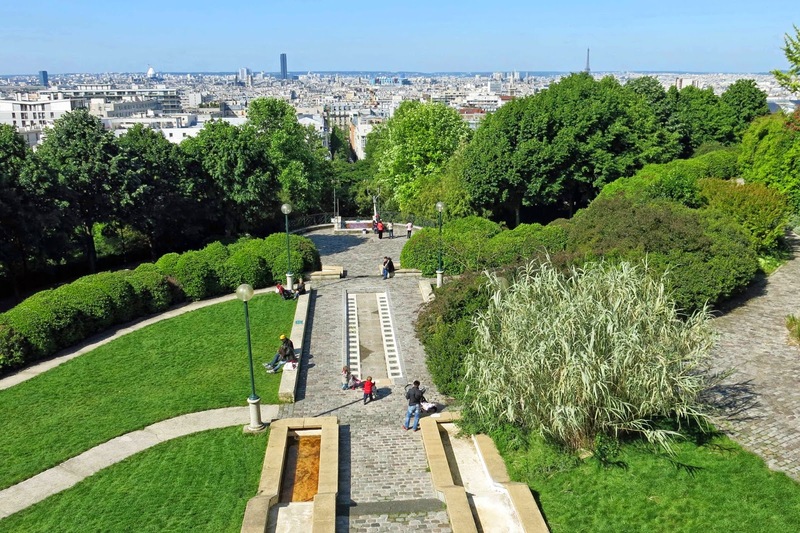 While most people will congregate on Montmartre hill, explorers in search of new discoveries can venture to the top of Belleville Park, located on the hill that shares the same name, which rises over a 100 meters. The first pleasant surprise: here, there are no crowds and you can enjoy the panoramic view of Paris without having to jostle with tourists. 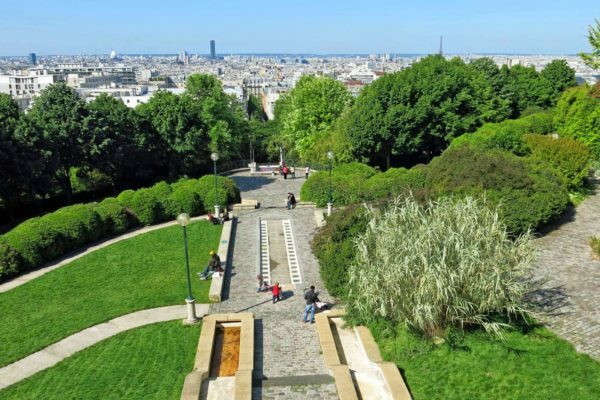 Visitors can take their time and admire the multi-tiered garden in the foreground, punctuated by a waterfall, with the Eiffel Tower, the Montparnasse Tower and some of the most beautiful monuments in Paris in the background. Overlooking Belleville Park, there is a balcony, referred to “My Heart Belleville” offers visitors the opportunity to comfortably contemplate the many lights of the city. Once inside the Arab World Institute, take the glass elevator to the 9th and final floor, which happens to be a huge, 300m2 terrace on the roof. It is a spot that remains relatively unknown to this day. 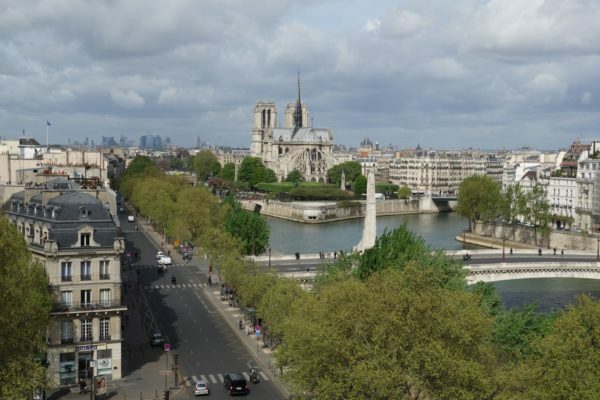 Here, visitors can get a look at one of the most beautiful views of Notre-Dame de Paris. This famed cathedral, is viewable here from the back, as if it were snubbing the Seine. The same can be said for the Ile de la Cité and the Marais district. This poster for paradise features the white facades of the buildings on the docks, the Tournelle bridge, overlooked by the statue of St. Genevieve, patron Saint of the capital, and the ever-changing Paris skyline. 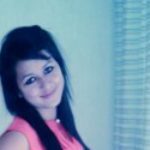 It is a spot that you do not want to miss if you are looking for unique photos! Perched at 210 meters of altitude, the Montparnasse Tower dominates the Parisian skyline and offers an unrestricted observation point of the Eiffel Tower and the rest of Paris. Climb aboard Europe’s fastest elevator and gain the 56th floor in just 38 seconds! A panoramic observatory with a breathtaking view of the capital is available to visitors there. With a 360° field of vision, it’s easy to search for Paris’s essential monuments in the distance and, if you desire, enjoy a glass of champagne at 360 Café to mark your ascent with a good glass. To have the opportunity to enjoy the view, visitors must brave the throngs of tourists who flock to the Lafayette Galleries and find the right elevator, the one that will take you directly to the 7th floor! 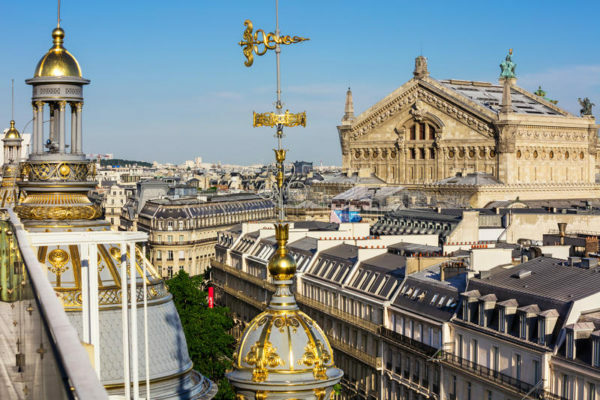 Once up there, you will win the privilege of discovering the district from a new angle, all the while capturing all the beauty of Haussmanniennes and Opera Garnier streets, both major vessels of the capital. Who can fail to notice, of course, the more distant views of the Invalides, the Montparnasse Tower and the Eiffel Tower. All of this, comfortably seated in one of the free red and white seats provided to enjoy the view. You can’t discuss the best views of the French capital without mentioning the Iron Lady herself. Perched more than 300 meters high, it is the highest point of the city! You will be amazed by the view it has to offer, be it from the second or third and final floor. 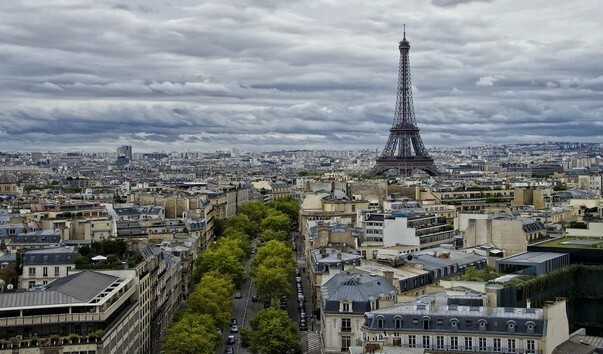 First, go up to the top of the Eiffel Tower in order to take in a grand view of the city of Lights. You can also go down one floor to get a closer look and focus on the city’s most iconic monuments. At the top, if you wish, take a trip to the champagne bar to accentuate the view and properly celebrate such an experience. Be careful however, you will obviously be inundated by a mass of tourists who love to take pictures. This is therefore another viewpoint where it’s best to go during off-peak hours if you want to take advantage of this extraordinary show. To properly marvel at the Champs Élysées and the Place Charles-de-Gaulle, you need a bit of altitude. Here’s a tip, climb the 284 steps of the Arc de Triomphe to access its panoramic deck, which will change your mind about the neighborhood. 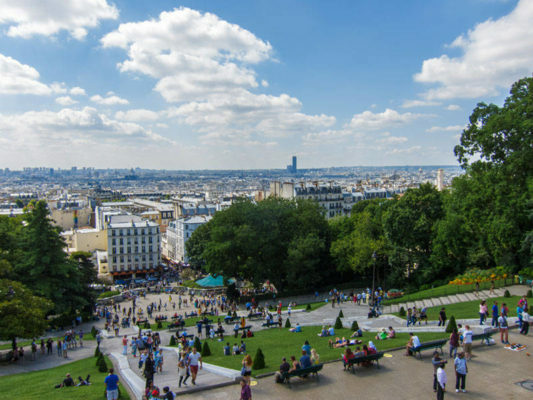 Up there, from merely 50 meters away, visitors can view all 12 avenues, starting from the famous star-shaped roundabout, with all the Parisian monuments, starting with, of course, the Eiffel Tower. To be even more amazed, try to go at night or during the holiday season, when Paris is lit up for all to enjoy. The restaurant at the top floor of the Printemps (Le Déli-Cieux) has a 360 ° panoramic terrace with lovely rooftop views. Visitors can discover the Madeleine, the Sacred Heart, the Eiffel Tower under a new angle and can watch the teeming activity of the district, heart of Paris Haussmann, from above. 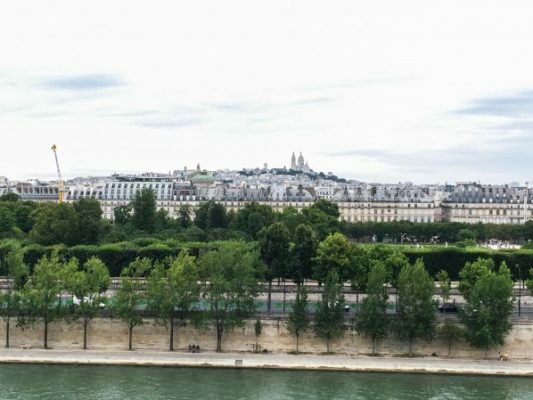 Although it’s not widely known, the museum of Orsay offers a beautiful balcony which features a very appreciable panorama on the Seine. It’s perfect for cooling off or head to the Louvre to say hello to the Mona Lisa. If the view is not enough of a show, visitors can take advantage of the opportunity to take in this museum’s phenomenal size. A former Parisian metro station, it is sometimes difficult to grasp how big it really is! From inside, through the huge clock, visitors can access a whole other Parisian district, that of Montmartre, which offers even more spectacular views. The ability to climb Paris floor by floor, thats what the escalators are like at the Pompidou Center. At each level, visitors can take in postcard views. First, the district’s big buildings, then Montmartre hill, and then the Halles, the Eiffel Tower, the Montparnasse tower, the Defense… The wonders keep going up until the 6th floor balcony! When you get there, you can prolong the pleasure with a drink at Georges, the restaurant located on the balcony, on the top floor of the museum. Hold on tight, the ascension aboard this balloon will propel you 150 meters above André-Citroën Park, as far as its anchor will permit it. During the course of the 10 minute flight, you will be surprised to see the Eiffel Tower appear just beyond the tall buildings of the Beaugrenelle district. Af first it’s just the tip, then the second floor, first floor, until the whole monument is at your disposal! The view of the La Defense district in the distance, behind a beautiful branch of the Seine, is also breathtaking. The experience is impressive and the feeling of being tossed by the slight wind is enjoyable as long as you don’t have vertigo.